At ARVR INNOVATE for the first time are Somewhere Else Solutions – a UK based innovation agency dedicated to making the workplace a better place. They are focused on helping forward-thinking organisations unleash the full potential of their workforce through bespoke Immersive Learning solutions. GEMBA® is the world’s first accredited Leadership Masterclass in Virtual Reality. Somewhere Else Solutions worked with The Leadership Network in partnership with BMW and HTC to try and solve the challenge of achieving operational excellence through scalable executive-level leadership training. 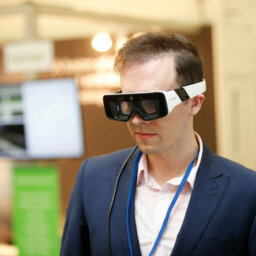 The platform effectively works as a VR university where users can learn about LEAN Leadership through immersive case studies & exercises and well as multi-user conferences and workshops. BODYSWAPS is a soft skills training platform powered by AI and Virtual Reality. It empowers employees to practice a range of workplace scenarios with AI-powered virtual humans.